The U.S. disposes of more than 384 million units of electronic waste each year, and less than 20 percent of that is recycled, according to the Electronics TakeBack Coalition. The remaining 80 percent is burned or dumped in landfills, leaking toxic substances like mercury, lead, cadmium, arsenic and beryllium into the environment. For companies that clean up the mess, this is big business: ABI Research expects the worldwide market for e-waste recovery to reach nearly $15 billion by the end of 2014, up from less than $6 billion in 2009. Serial entrepreneur Mark Bowles aims to be part of the effort to reduce e-waste--a problem to which he inadvertently contributed during his 25-plus years in the semiconductor, wireless and tech industries. "It was good work, noble work that we were doing, but the electronic waste problem has gotten pretty severe," he says. Bowles was spurred by a Nokia survey that found that only 3 percent of people worldwide recycle their mobile phones. 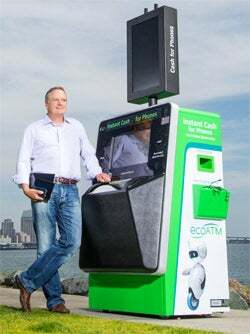 In 2008 he founded San Diego-based ecoATM, which makes fully automated self-serve kiosks that buy back electronics from consumers in exchange for cash. Bowles, who was inspired by Coinstar change-counting machines, spent three years perfecting his device. After securing seven patents and nearly $72 million in financing, his company went into full-scale production in late 2011. The technology combines an artificial-intelligence-based vision system with robotics and electrical inspection. The result: EcoATM can recognize 4,000 types of phones, MP3 players and tablets and identify any damage; it then uses a constantly updated worldwide auction system to offer consumers competitive prices based on model and condition. The average seller walks away with $25, but payouts can reach $300 for a new smartphone. Thieves need not apply--the machine validates the user's ID, requires a thumbprint scan and extracts serial numbers from the devices; hi-res cameras capture photos of the seller, and each transaction is monitored remotely by the ecoATM staff. The company resells 75 percent of the devices to refurbishers; the rest go to e-waste recyclers who are certified by R2 Solutions or e-Stewards industry standards. With the help of EPA calculators, Bowles has determined that the reduction in greenhouse emissions from use of a single ecoATM in one year is equivalent to that of taking three cars off the road or 21 houses off the grid. Early on Bowles theorized that placing ecoATMs in highly trafficked areas (mostly malls) and offering instant gratification (cash) would entice consumers to recycle. He was right: In 2012 the kiosks collected hundreds of thousands of phones and paid out millions of dollars. There are currently 350 ecoATMs in 24 states, and the company is placing two more per day and making plans for international expansion. Meanwhile, it's improving its technology so ecoATMs can accept bigger items like personal computers. As Bowles explains: "We're using technology to solve a problem that technology created." For outdoor adventurers who don't want to leave it all behind, portable solar units from Goal Zero power everything from smartphones to laptops to small refrigerators. Organic Transit's ELF and TruckIt: With pedal power amped up by solar panels, these vehicles make smart cars look like gas-guzzlers--but still haul serious loads. Scan unwanted paper mail with the PaperKarma app, which will contact the sender and unsubscribe you from the mailing list. gDiapers: A compromise in the cloth vs. disposable debate--reusable cotton diaper covers with biodegradable inserts that can be flushed, composted or trashed. Define Bottle: An eco-friendly water bottle with a DIY fruit-infusion function. Green Toys' colorful playthings are made in California mainly from recycled plastic milk cartons (15 million used to date) and other environmentally friendly materials. Winner of SXSW's Eco Startup Showcase, PlanetReuse matches salvaged building materials with designers and contractors to cut project costs and promote sustainable construction. Making solar energy affordable for homeowners, Sunrun installs panels upfront, then offers leasing plans to pay them off gradually. Root3 Technologies helps big energy users (colleges, hospitals, airports) cut consumption by up to 30 percent with web-based software that sends hourly performance reports for boilers, chillers and other equipment.